Happy Wednesday, y’all! I’ve loved sharing my wellness posts with you all like my natural deodorant one recently. I’m not sure why I have held off for so long! I think it’s mostly because I’m not the perfect example of health, so I feel as if I can’t blog about it. But I’m also not the perfect example of styling looks or makeup application, so here we go! Like I have preached before, I’m all about balance. I keep eating Halloween candy like it’s all going to be gone off the shelf tomorrow but I never miss a morning drinking my ginger/turmeric hot lemon water [will blog that later!]. 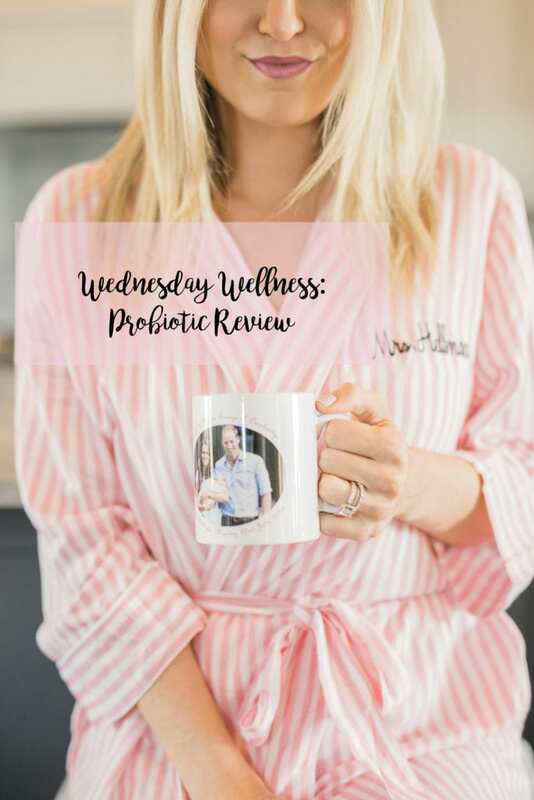 A new probiotic just launched with TULA and I think I received 80+ e-mails asking to review it, so here we have our first Wednesday Wellness post! I’ll be honest, I had absolutely zero intention of reviewing these probiotics. It wasn’t because I wasn’t interested, I had already planned on ordering them to try! 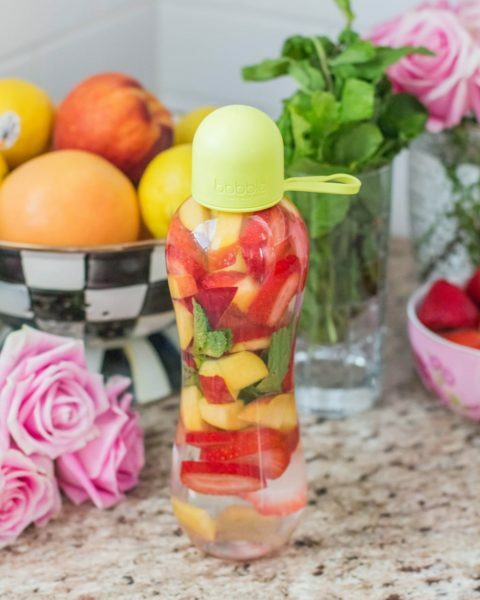 Many of you know, TULA uses probiotics to balance your skin. They were a trendsetter in the skincare industry to incorporate probiotics into your skincare routine. Dr. Raj, the creator of TULA, is a gastroenterologist. So it makes even more sense that she would have a probiotic say over a face wash. And we know how much I love my TULA face wash. I take that stuff with me everywhere. 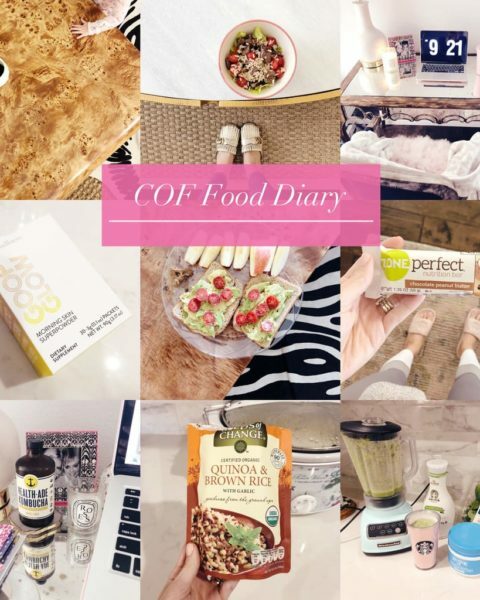 But I didn’t think to review these on the blog because everyone has their own vitamin routine and up until reviewing these, I didn’t know all that much about vitamins. We all know the importance of taking probiotics, but in my experience you either find one that hurts your stomach or that doesn’t. That’s how you choose your probiotic! Right?! Like I said earlier I got more e-mail requests to review these probiotics than I have over anything else. Ever. 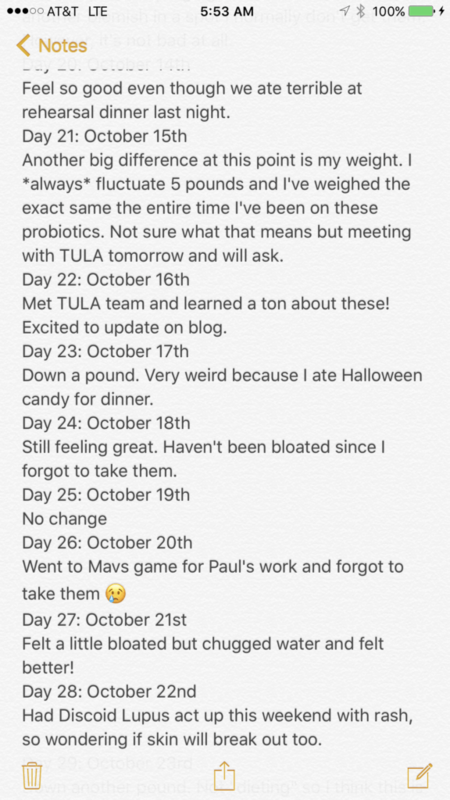 So I decided to keep an iPhone diary of my month review. How professional fancy of me. This is a very honest review. I missed a few days. I felt bloated some days from skipping. You get the idea. Now before we dive into the results, let’s talk about what probiotics claim to do. Before taking these I knew probiotics were the “good bacteria” that balanced the bad. By balancing the good bacteria with the bad, probiotics help keep your body functioning as it should! Their main goal is to help you with your digestion. You can read more information here on their site about these probiotics. Ultimately, they claim to help with everything from inflammation to metabolism issues. How would this alter your skin? Because probiotics help with inflammation they also help soothe the skin, but this doesn’t act as a topical application. 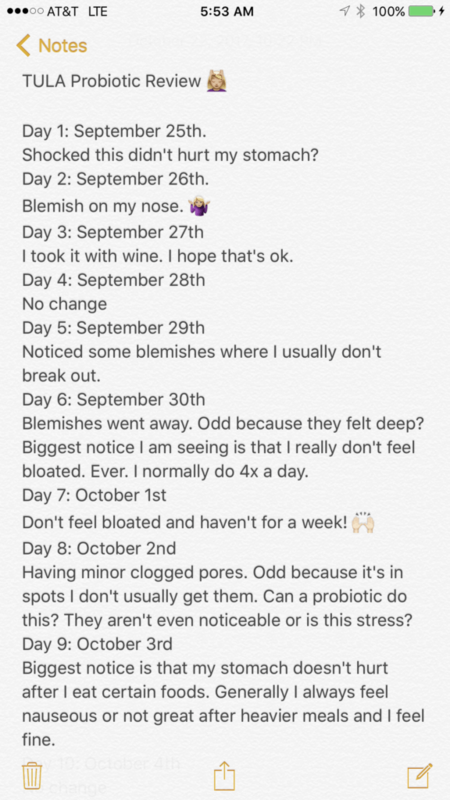 You have to consistently take probiotics for weeks – months to see a huge difference in skin, so this review is more on how I felt internally. But with that being said, probiotics are even said to help calm eczema. These also include Vitamin C and Ceramides to help retain moisture, promote firmness, help with texture and skin tone. They are gluten, lactose and soy free along with being vegetarian and non-GMO. They have no artificial sweeteners and no Sodium Magnesium Stearate. I learned so much more about probiotics [which I’ll share later] but ultimately, I just felt good. If my 3rd grade teacher were reading this I know she would cringe; I’m using “good” to describe how I felt. But I know so many women deal with bloating, random bouts of nausea and just an overall “blah” feeling. When I took these I didn’t experience any of that! I didn’t feel sluggish. I didn’t feel bloated. I didn’t feel “sick” after splurging on a meal. I felt lighter in the sense I never felt overly full. I want to note I did lose 3 pounds, however I didn’t know that would happen. I learned probiotics speed up your metabolism, so that is something to keep in mind. I also want to note I did break out in the beginning, but that was related to my Discoidal Lupus. For a flare up I’ll get what I think is a break out, but then the rash and irritated skin occurs. Looking back it makes more sense as to why I broke out. That’s not related to probiotics, many of you know my Lupus acted up after I had Maxi. Lupus has this 1/3rd rule with pregnancies. 1/3 of women with Lupus get worse, 1/3 get better, 1/3 see no change. I just happened to have flare ups- but it’s not a big deal at all! This is a skin supplement as well as it helps you retain moisture AND it is filled with Vitamin C. However, I don’t think you would see a big change in skin until your 2nd month as this is working internally. Curious if you would get the same results? Let’s backtrack to my symptoms before taking the probiotic. 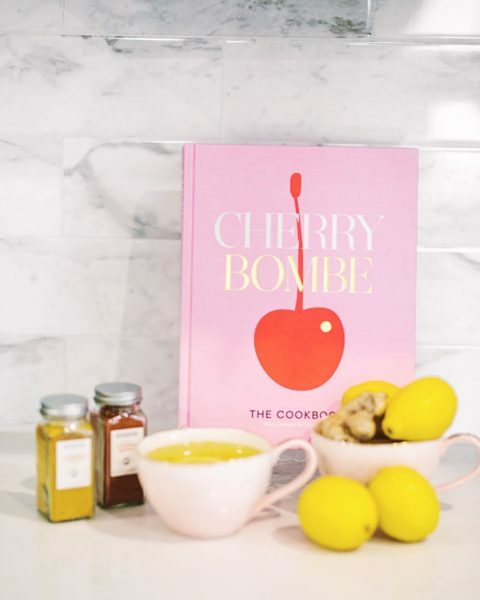 If you’re a longtime reader, you know that before I got pregnant I did Whole 30 and continued to eat a paleo diet. Until I got pregnant and the only thing I didn’t throw up were saltines. TMI. I know it’s quite a COF joke that Katey loves queso. But to be honest, I maybe eat it 5 or 6 times a year [MAYBE] because I feel awful eating it. But it’s Texas and queso is incredible, so I always talk about it. 😉 I’ve had food testing done. I’ve seen doctors. I’ve seen holistic doctors. Nothing is wrong, I’m just sensitive to certain foods which is pretty normal for having an autoimmune disorder. That’s why at home I try to eat really clean as eating clean of course doesn’t bother me. Probiotics do help with food sensitivity, but I’ve never found one that I can take consistently otherwise I feel nauseous and pretty crummy. Before this I’d never taken a probiotic religiously because I’d be doubled over nauseous and in pain. 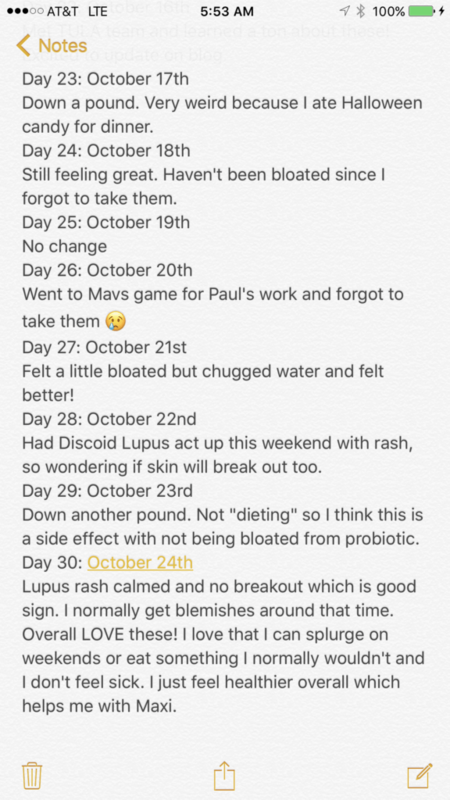 Let’s look at my 30-day log to see the symptoms broken down. I seriously didn’t think I would actually post this, so excuse typos and my lackadaisical tone. I truly just thought this was for my eyes only and I’d review them in another manner. But I really like my reviews to stay organic and natural, so what’s more honest than this?! As you can see, if I skipped it I could tell. I’m not sure if that’s a downside to you or not, but to me it’s like washing my face. If I don’t take my makeup off at night, you better believe I’ll get a blemish in a week. That tells me my face wash is working. But for the first month [in years] I didn’t feel sick from eating food. Ever. I had things like queso, nachos and plenty of fried food at a rehearsal dinner. I had heartier fall dishes. I ate far too much Halloween candy because my mother thinks it needs to be out on display come October 1st. But I felt good. I typically fluctuate in a 3 pound range, which I think we all do as women right?! Fluctuating is so common, but one odd side effect is that I didn’t fluctuate at all. However, at the end I did lose 3 pounds. I wasn’t dieting and didn’t even know I would lose weight, but I did want to note that. Now, I’m not saying this probiotic is a crutch to eating poorly. I’m not saying that at all! But this is coming from someone who has eaten before weddings or parties because I get scared I’ll feel bad after. It was a relief to find something that makes me feel fine when I do want to eat out or eat a dish I wouldn’t normally make. If anything, taking these allowed me to enjoy a dinner and then get up the next day and run off that splurge because I felt good. It was my crutch to continuing a healthy lifestyle after you “live” and eat at a delicious rehearsal dinner. 110% yes. All of this to say, this makes me so much more cautious on the vitamins I buy for my family. Filler? Lack of refrigeration and standard of transportation? NO WONDER past probiotics have made me feel AWFUL. I’m glad the timing worked out I met them at the end of my month trial because it made all my symptoms make sense. 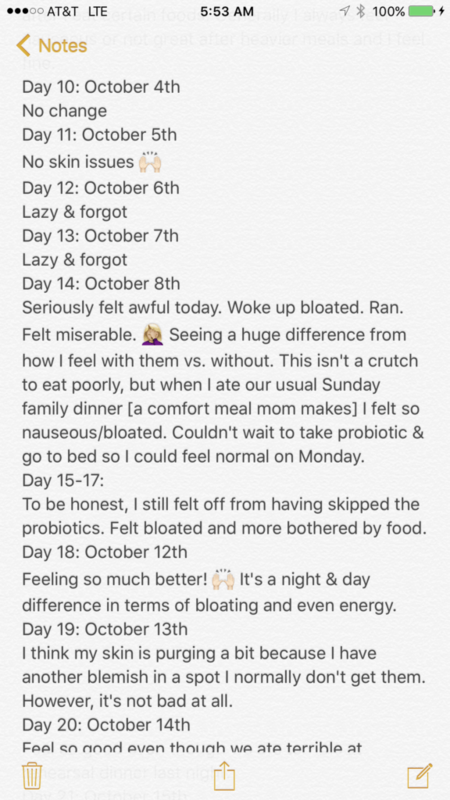 I don’t feel bloated because I’m taking pure probiotics and not junk with filler, etc. I have already purchased more and honestly plan on buying 2 packs at a time as I get worried to be without, considering the symptoms I have. You truly don’t notice how miserable you can feel from food or bloating until you don’t experience those symptoms. I hope this review helped those that were curious about these bad boys! This was definitely an organic review as you can see by my iPhone notes! ha. It’s not the most professional looking, but it’s real! P.S. If you are nursing, ask your doctor! I’ve heard differing opinions on nursing and probiotics from friends and medical professionals alike, so I don’t want to tell you one thing and your OB think another. TULA recommends you ask your OB as well. We have weaned, so that’s why I reviewed these. Great review! So are the tula probiotics refridgerated? You just store these in a cool, dry place! With these exact probiotics refrigeration is not necessary! SO glad you blogged about this – I just bought these and cannot wait to try them!! I have irritable bowel syndrome which makes me constantly feel bloated regardless of what I eat. I’ve been wanting to try probiotics for a long time but nothing ever seemed right. Your review was really helpful! I have chrons so I 100% know what you mean when you say that autoimmunes make you sensistive to foot. I’m not on any special diets but am so sensitive to almost everything that I barely eat at work, drink a ton of water and hope for the best ???? Definitely giving these a try! Thank you for reviewing! Just ordered these probiotics and I’m so excited to try them, especially with all the rich holiday meals coming up! All your symptoms I’ve had for years. Now I take a Zantac 150 every morning because other than a 1billion acidophilus, all other probiotics tore my stomach up. Know exactly what you mean about foods. Actually some healthy fiber foods do the same thing to me. I’m going to try these since they don’t have the fillers. Thank you for this authentic review and asking questions to TULA, otherwise with all the sensitivity I have to things I would have never tried them. Maybe I’ll even be able to get off the Zantac as well. Again, thank you SO much!!! Oh, one more thing, do you take this at night or morning?? I LOVE that you had the mug of Will and Kate in your pic – haha! 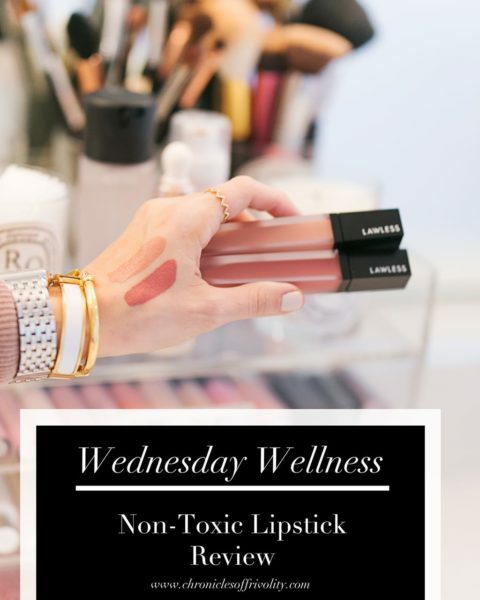 Also, Wellness Wednesday is such a good idea! I love hearing from others what they do to make their lives a little more healthy. Are you going to start doing this every week? Hi Amanda! I think men can 100% use these! Thanks for doing this review! My stomach has always given me issues when I eat so I’m looking forward to trying these! Where did you get this mug?!? haha Love it! Hi Meghan! I borrowed it from my friend actually! haha! Her family is from London so I’m thinking it may be from there! Loved this review! Purchased before I even finished reading, can’t wait to try them out! 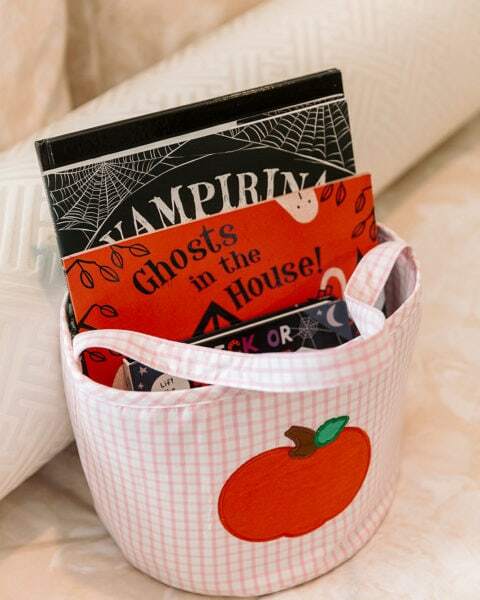 + free shipping, yes please! ???????????? Hi Katey! 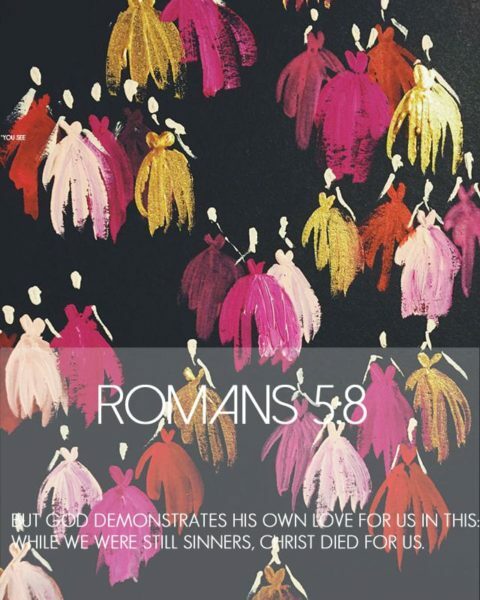 Love this review! I have horrible stomach issues so I have been trying out a few probiotics but they are chewable because I have a hard time swallowing pills and companies always make them so big! I really want to try these but I see they come in pill form. Are they difficult to swallow? Thanks so much!! Great probiotics review., thank you for sharing.